Bromoform (CHBr3) released from phytoplankton and kelp in the ocean is the largest known carrier of bromine into the upper troposphere and lower stratosphere. This can lead to ozone depletion and thus impact the climate (ozone is a powerful greenhouse gas). In the open ocean, phytoplankton is the main source of CHBr3 and diatoms in particular are known to be a major CHBr3 producer. The link between CHBr3 production and oxidative stress has never been clearly demonstrated in microalgae. This study is providing new insights on that matter. The reasons why marine organisms produce organobromine compounds are still not fully understood. Bromoform is mainly formed from the bromination of organic substrates by reactive bromine species such as HOBr. These reactive species are produced when haloperoxidase enzymes catalyse the oxidation of hydrogen peroxide (H2O2) and may help to detoxify the cell from this harmful compound that creates oxidative stress. We investigated the effect of oxidative stress induced by two different limitations (CO2 and nitrate) on CHBr3 production of two marine diatoms cultured in axenic conditions. We chose to study two warm-water strains isolated from subtropical waters, Chaetoceros neogracile and Phaeodactylum tricornutum as to our knowledge, to date only cold-water diatoms and one temperate diatom have been shown to produce CHBr3. 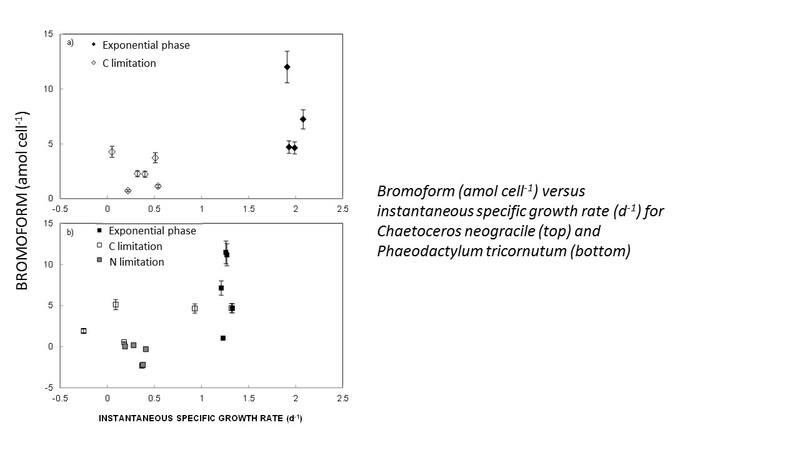 During exponential growth the bromoform production was 2 000-3 000 nmol bromoform (g Chl)-1 h-1, i.e. 10-100 times higher than previous values for temperate and cold-water diatoms. Bromoform production decreased down to zero under CO2 and nitrate limitation for both species. The results suggest that the bromoform production may be directly related to bromoperoxidase activity (and irradiance) only during exponential growth, while compounds other than bromoform may be formed under nutrient limitation. We also show an apparent trend in increasing CHBr3 production from cold-water to warm-water species (linked to increased irradiance). Should it be confirmed in future studies, this could explain the correlation between chlorophyll maximum and supersaturation of CHBr3 in tropical oceanic waters (Quack et al. 2004; Palmer and Reason 2009). Such differences would also have to be taken into account when modelling the marine sources of CHBr3 and may partly explain the large spatio temporal variations observed in the global ocean (Stemmler et al. 2015).